I’ve wanted to expand my photography beyond Southern Illinois for a long time. I spent a while mulling over what the perfect destination would be for my maiden out-of-state photo expedition. When I remembered that the Shawnee Hills are considered the foothills of the Ozarks the choice was obvious. A quick search on Google Maps revealed that the Ozark National Scenic Riverways is only roughly a 2.5 hour drive – perfect! Big Spring, located near Van Buren, was my first stop. I was running late and didn’t arrive until after sunset so I wasn’t anticipating any photography, but I grabbed my camera as soon as I pulled up and saw the mist shrouding the spring. 286,000,000 gallons of water coming out of the ground tends to make a little noise, which is fortunate because it was so dark I don’t think I would have found the spring otherwise. That’s the average daily flow, which makes it the largest spring in the U.S. and one of the largest in the world. This 30 second exposure was taken at the edge of twilight. I woke up for sunrise at Alley Spring. In addition to the spring, this site is also home to Alley Mill, a picturesque historic structure that once served the community for grain processing. Alley Spring has an average daily output of 84 million gallons. I was drawn to this scene’s overhanging tree, rocks, and pristine flowing water. Blue Spring is a special, exceptionally beautiful place, but difficult to capture in a photograph. The Osage Indians called it the “Spring of the Summer Sky.” Once you see it you understand why; it’s vivid color is unmatched. At 310 feet, it is Missouri’s deepest spring. As water moves up through the spring it dissolves limestone and dolomite, giving the water its rich color. Peering down into Blue Spring’s unworldly blue water transported me to the Caribbean, temporarily forgetting that I was still deep in rural Missouri. The water’s impressive blue soon fades as it makes its way toward Current River. My last stop was Greer Spring, which is not a part of the Ozark National Scenic Riverways, but well worth the effort to find. With an average daily flow of 222 million gallons, Greer is Missouri’s second biggest spring. Unlike Big Spring and Alley spring, which one can practically drive up to, this one is a mile hike down into a steep ravine. 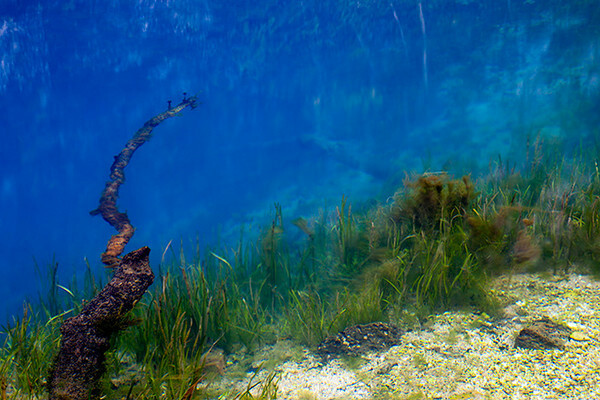 Greer Spring’s water flows from two sources, the first being a cave at the mouth of the spring. The rest of the water bubbles up a short distance downstream. It is a sight to see that much water gurgling up, especially with that turquoise color. I greatly enjoyed the peaceful seclusion I found at Greer Spring. Like the Shawnee National Forest, Missouri’s Ozarks are filled with some of the Midwest’s hidden gems. I only scratched the surface of the photographic potential during this trip; it won’t be my last! Tagged "alley mill". "alley spring", "big spring", "blue spring", "eminence, "greer spring", "missouri ozarks", "missouri springs", "missouri", "ozark national scenic riverways", "ozarks", "van buren", mo"